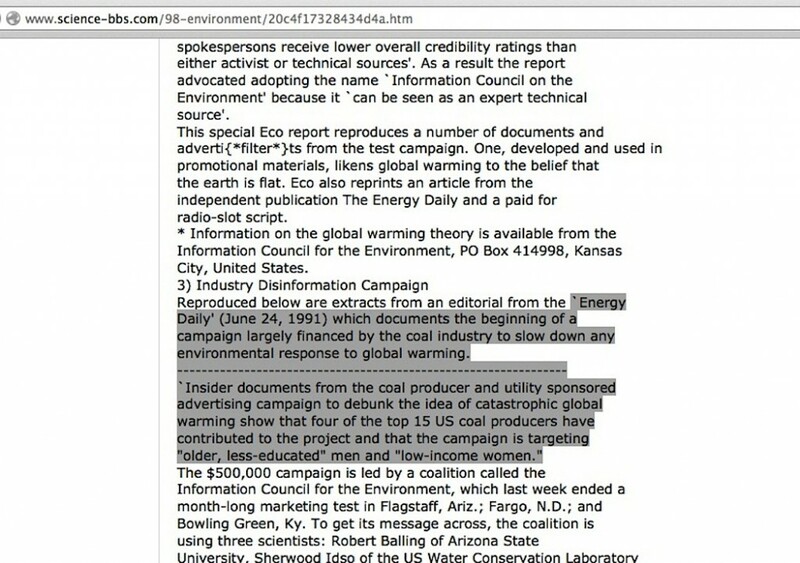 I’ve said it many times, the entire global warming crisis can be boiled down to a three point mantra, “the science is settled” / “skeptics are industry-corrupted” / “everyone may ignore skeptic material because of points 1 & 2.” With the latest fixation on using racketeering laws to persecute companies and organization siding with skeptic climate scientists, a fourth talking point could be added, “when deniers persist with their industry-bought and orchestrated lies, they should be charged with crimes against humanity.” But the entire notion hinges on the insinuation that scientists who had even the most tenuous financial tie to industry donations were corrupted – paid to lie in a manner no different than shill ‘experts’ working for the tobacco industry who said smoking didn’t cause lung cancer. An insinuation so memorably compelling that ordinary citizen enviro-activists can regurgitate it with ease. 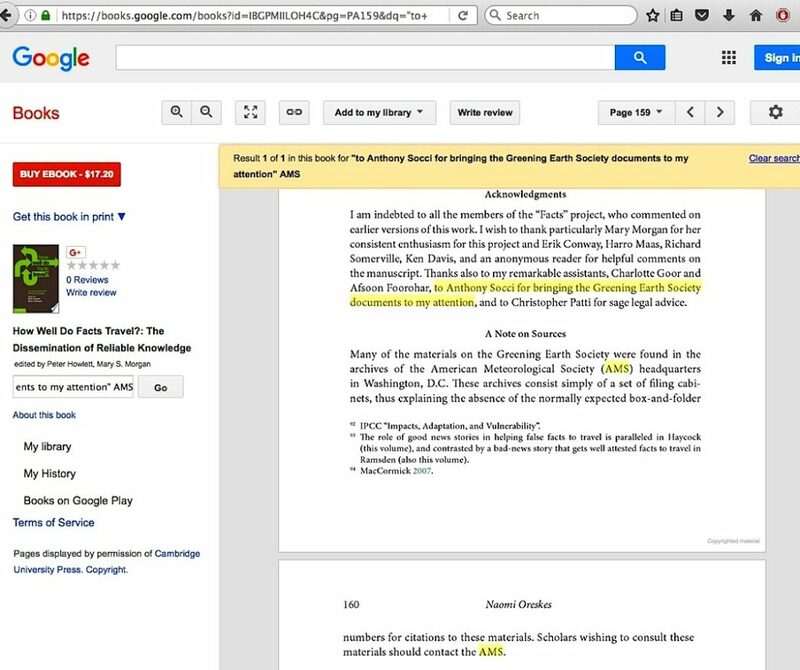 It’s impossible to count the number of people who say skeptic climate scientists and others associated with them are paid industry money in exchange for pushing false industry-directed climate assessments, but the thing that must never be overlooked is that the only ‘evidence’ to back this up (as I’ve detailed over the last six years) is a specific subset of leaked memos out of the 1991 Western Fuels Association “Information Council for the Environment” (ICE) pilot project public relations campaign. 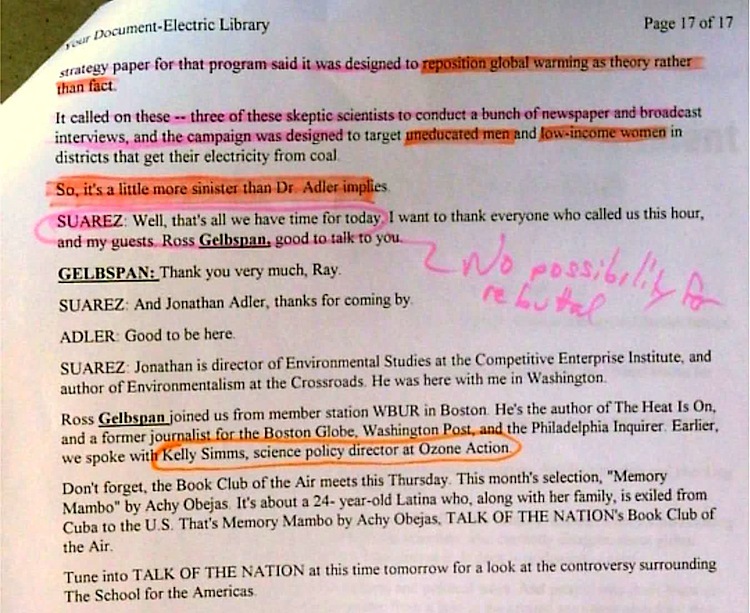 Namely, memo pages which had so-called strategies to “reposition global warming as theory rather than fact,” an alleged lie which needed to be aimed at “older, less educated males,” and “younger, low-income women”. 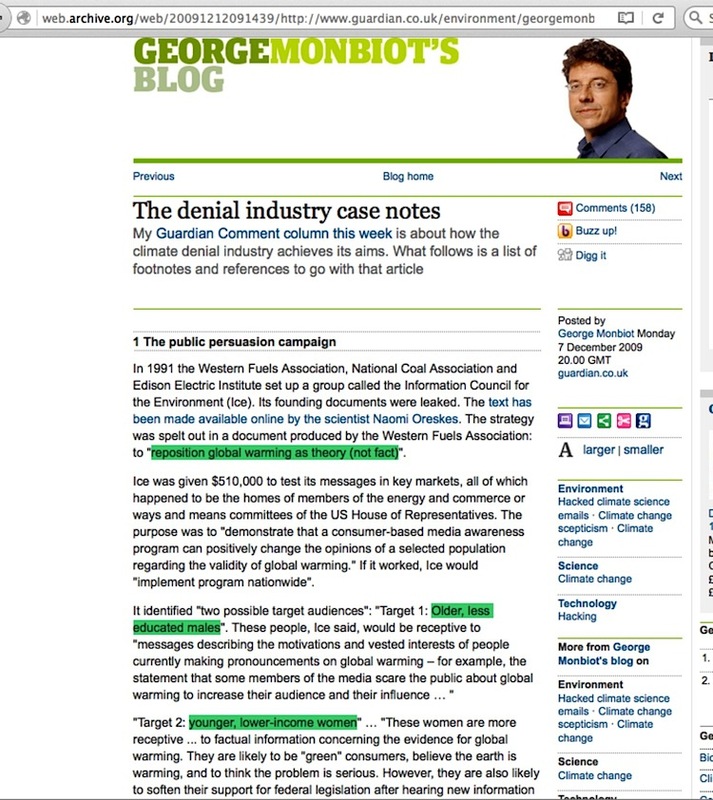 Luminaries such as UK Guardian reporter George Monbiot, Newsweek’s Sharon Begley, and the collective Union of Concerned Scientists are what I call repeaters of the accusation. They publicly repeat the accusation with the intention that it will cause harm to skeptic climate scientists, but they only trust that the accusation is true. In any potential future legal action, some value might be gained from depositions out of very prominent repeaters as to exactly how they learned about the accusation, whether they utilized any talking points fed to them about it, and who fed them the talking points in the first place. Lawyers may elaborate on this since I profess no legal expertise on it, but libel/slander (defamation) as I am aware of it is when someone intends to harm someone else’s reputation with material that is not true, and the accuser knows it is not true. The pushers of the accusation, those who not only quote the Western Fuels ICE campaign memo phrases, but who have also seen the ICE memos firsthand, could potentially find themselves faced with defamation lawsuits. 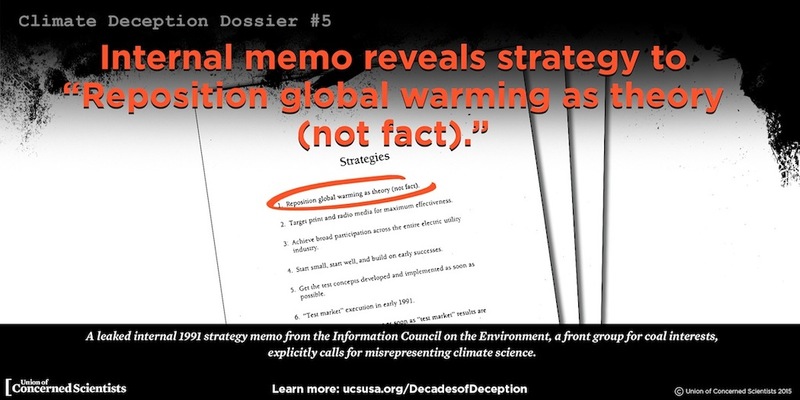 They had the most direct opportunity to undertake due diligence with the memos, particularly the source of the memo subset with the “reposition global warming” phrase, to determine whether the phrase was indeed the sinister top-down industry directive it has been portrayed as. 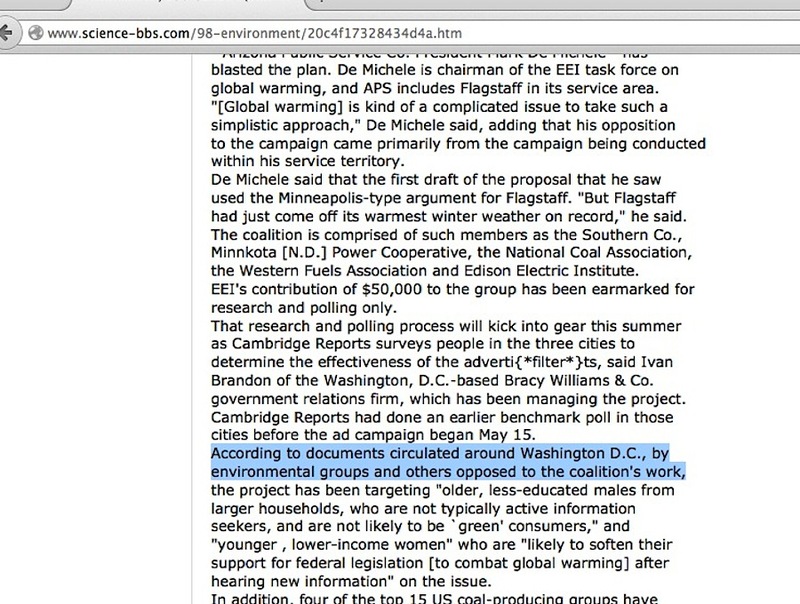 Did they know the ICE campaign contained no unified industry directive for skeptic scientists, and did they know the memo subset with the “reposition global warming” phrase and the “older, less educated males” / “younger, low-income women” phrases was never part of the ICE campaign, but plunged ahead with that narrative anyway? Therein lies the possible problem for the core pushers of the accusation. For investigators to dig deeper into this, they need to know who the core pushers were/are. 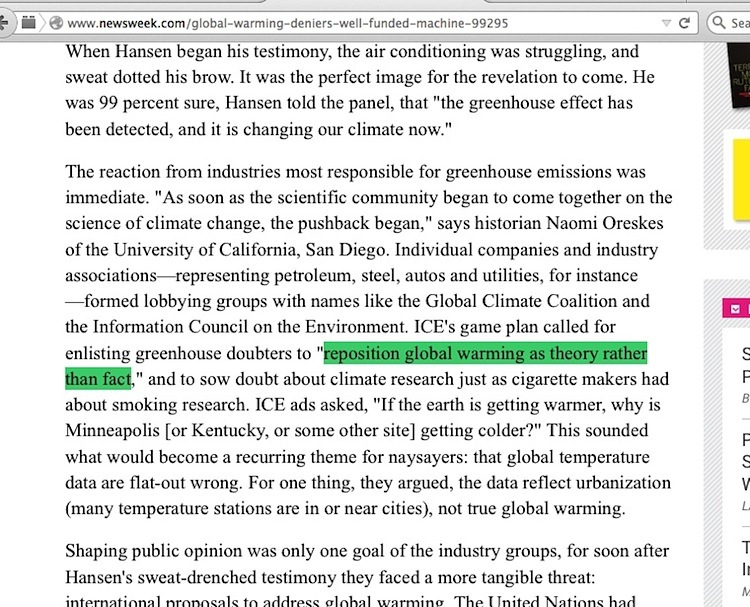 My research has its limitations, but as near as I can gather, the number of people who have seen the ICE memos and the “reposition global warming” subset which was a rejected proposal, could be less than two dozen people. 1) Gwenn Morreale. 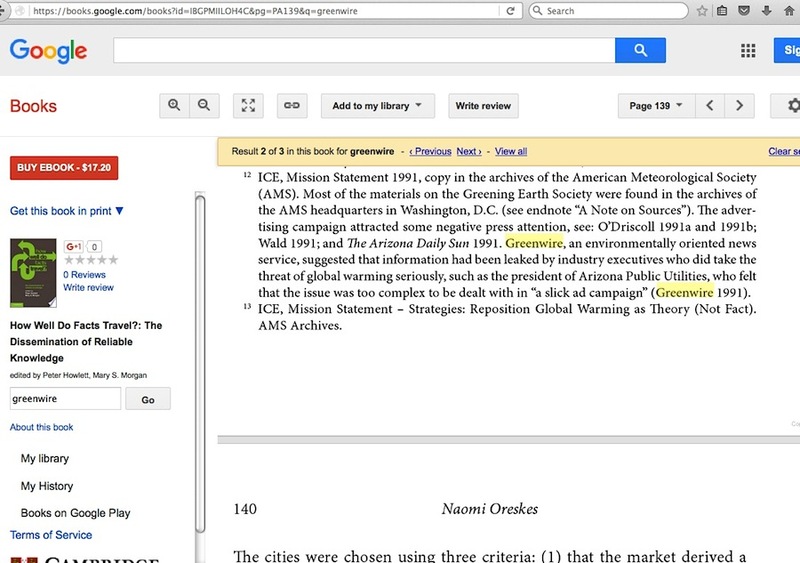 I dedicated most of my June 14, 2013 blog post to her, since at that time I was literally the only other person online who made an attempt to link straight to what I term the “Greenpeace USA née Ozone Action” ICE memos scan collection. 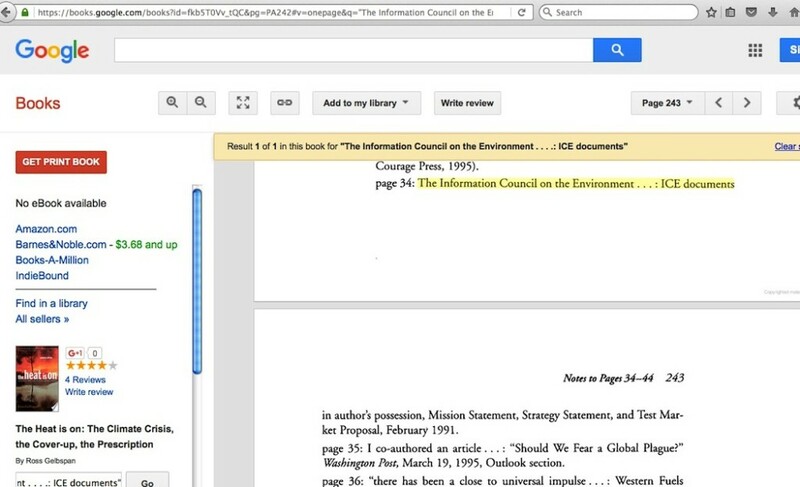 She knew somehow that those ICE memo scans were in Greenpeace archives, but the basic question is how she found out about it in the total absence of online reference to them, outside of my own links to them. 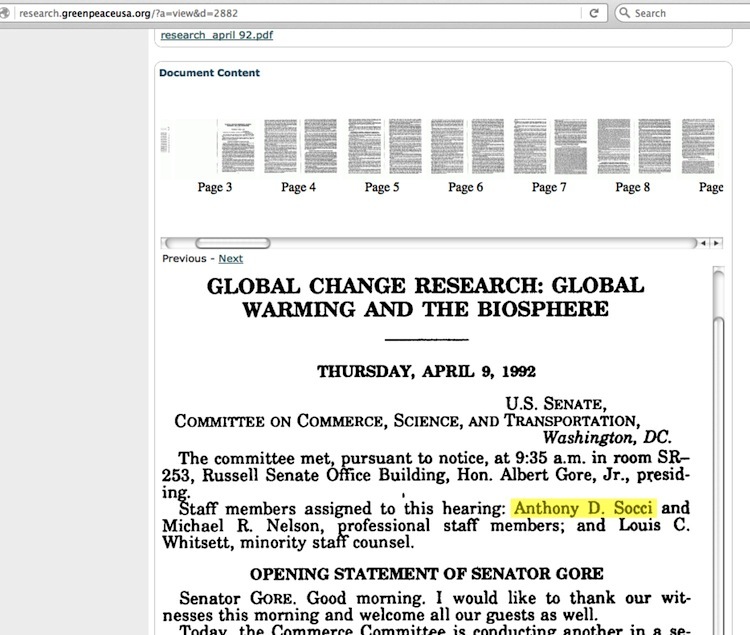 2) “environmental groups and others” circa mid June or earlier, 1991. 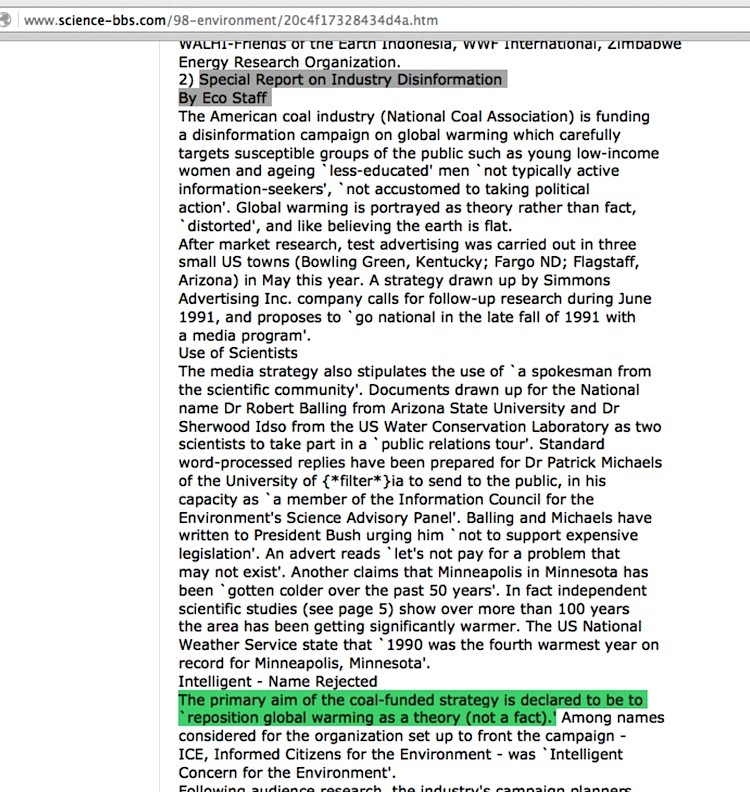 That phrase is from an Eco Geneva June 25, 1991 newsletter which reproduced portions of the article in item 3 below, but the newsletter itself quotes the “reposition global warming” phrase, which is not seen in their article reproduction. If that phrase and other details mentioned by the newsletter are not found in the full article in item 3, then the newsletter writers saw the ICE memos firsthand. The question is, who provided the memos to them? 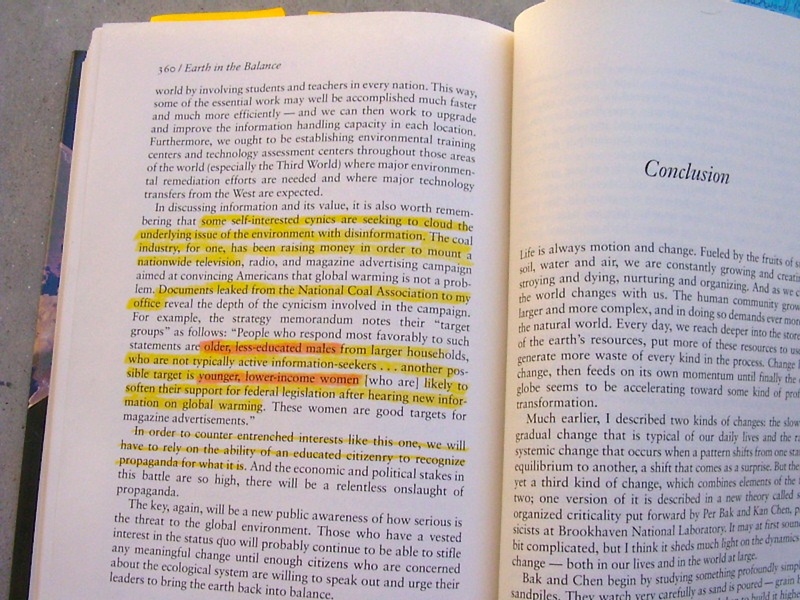 3) Mary O’Driscoll, The Energy Daily reporter, whose June 24, 1991 article was titled “Greenhouse ads target ‘low income’ women, ‘less educated’ men.” The Eco-Geneva newsletter just above reproduced portions of it. Similarly to the bit above, who provided O’Driscoll with the material? 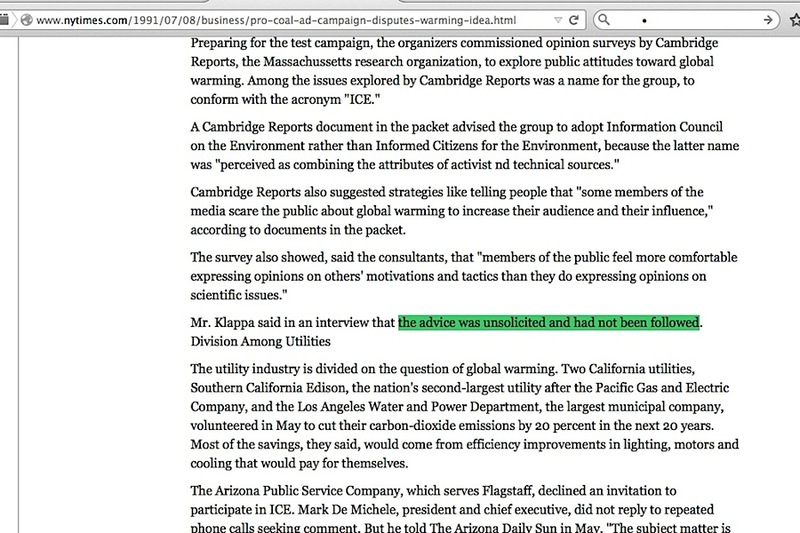 4) Matt Wald, New York Times reporter, whose July 8, 1991 article not only mentioned the “reposition global warming” phrase, it also said the newspaper received the ICE memos in a packet from the Sierra Club. One wonders if the NYT still has that material. Lest anyone forget, there is a big problem with this Sierra Club line. 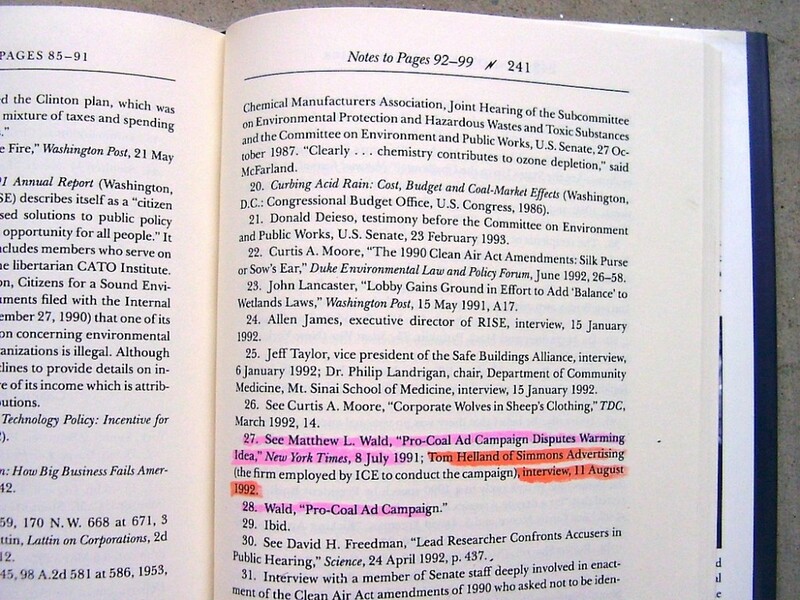 5) Book authors Alan Miller and Curtis Moore mentioned the “reposition global warming” phrase almost too casually in their 1994 book, noting that their source was Matt Wald’s NYT article, but what indicates that they saw the ICE memos firsthand was their book’s endnote on an additional detail about a worker within the ICE campaign, who they interviewed in 1992. 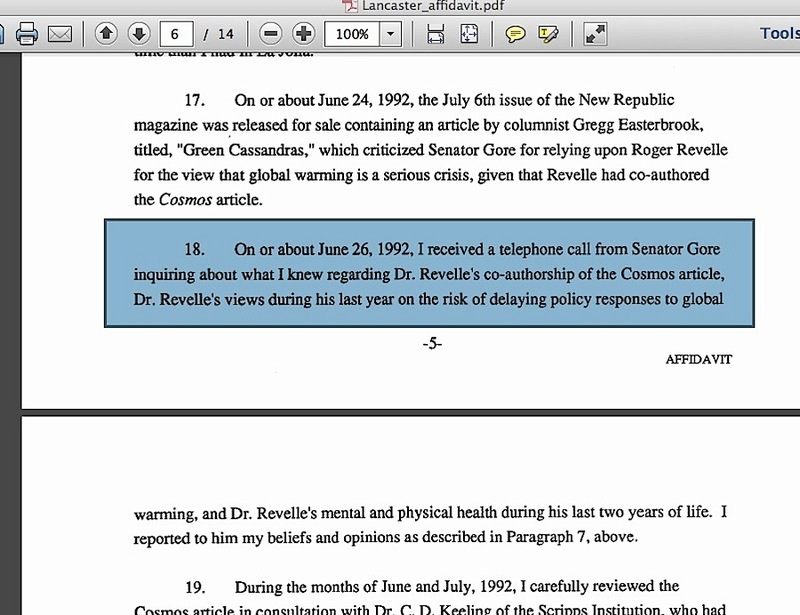 An additional thing to pursue here is what possible connection their book has to Rosina Bierbaum, a staffer at the White House Office of Science and Technology Policy who Al Gore once called on for a reference during a 1997 press conference. 7) Myanna Lahsen, a relatively obscure cultural anthropologist working largely in Brazil, having little to do with the global warming issue. 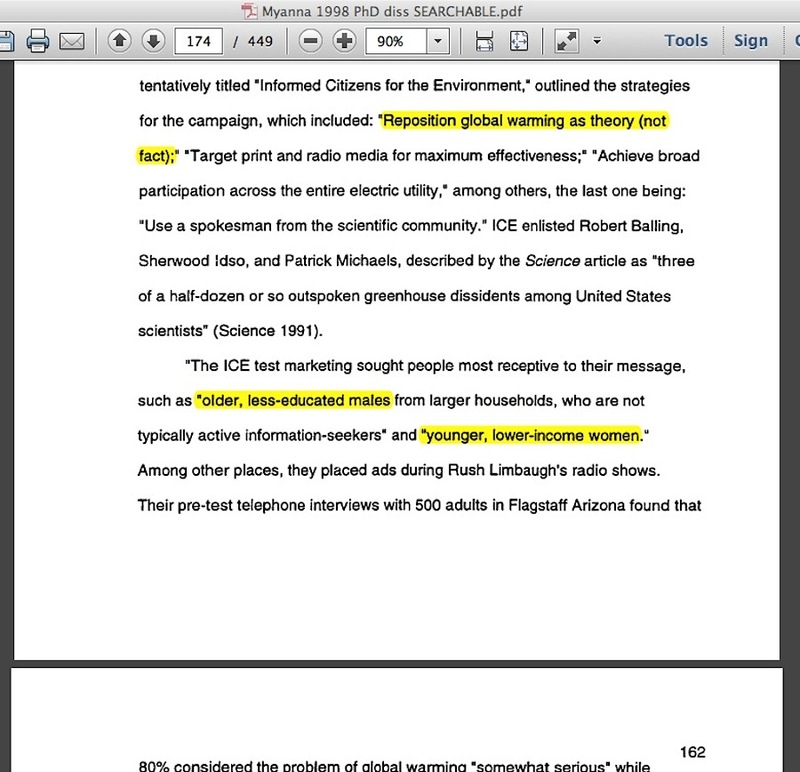 The key is her 1998 “Climate Rhetoric: Constructions of Climate Science in the Age of Environmentalism” PhD dissertation (abstract here) and its several detailed references to the ICE memos. 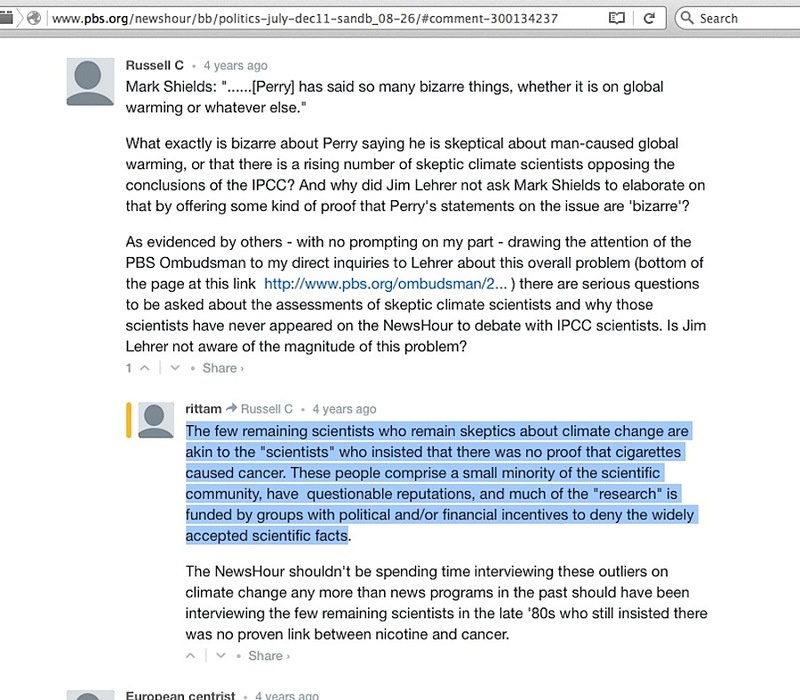 While it appears at first glance that she gets that ICE material from a 1991 Science magazine article (content behind a subscription wall here), it turns out the only applicable bit was her reference to the names of three skeptic climate scientists. She never specifies the source of the ICE memos. 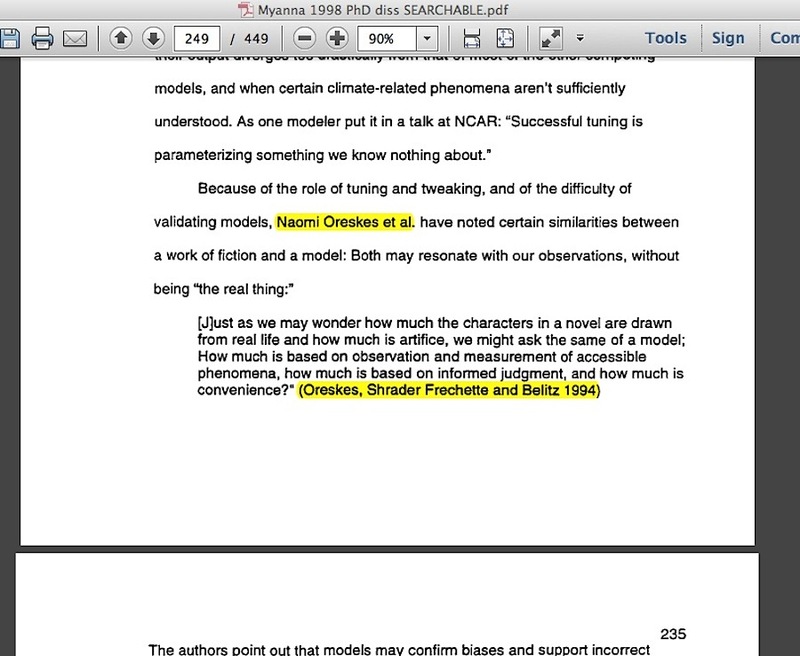 She has quite a noticeable association with Naomi Oreskes, and her dissertation cited a 1994 paper by Oreskes. 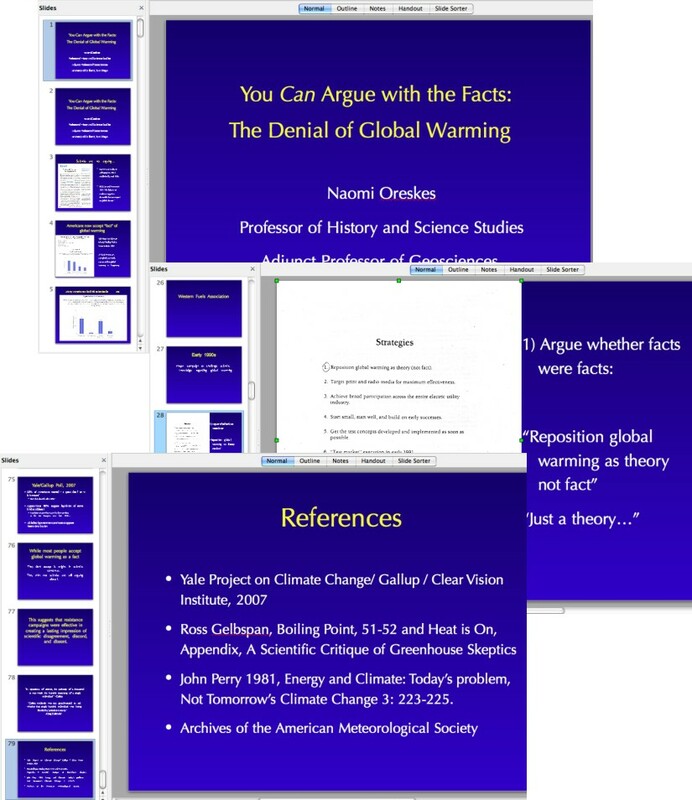 On top of that, her dissertation contains a disclosure about her meeting with Ross Gelbspan in the same month when his very first public piece about ‘corrupt skeptic climate scientists’ was published …. a disclosure immediately followed one sentence later with an incorrect label of him. 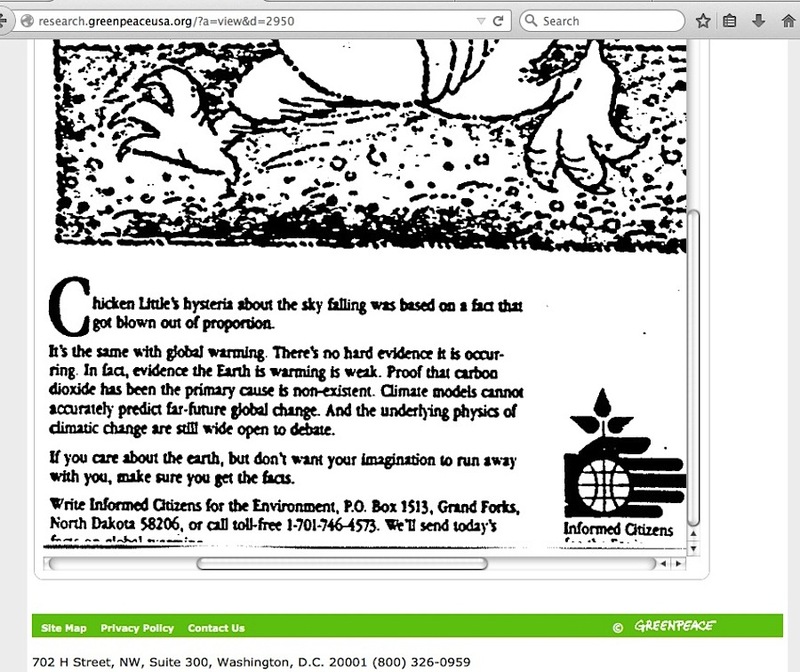 8) The people at Ozone Action, circa 1995-’96, and the earliest tie in with Ross Gelbspan. They “obtained” the ICE memos, but they never say from whom. 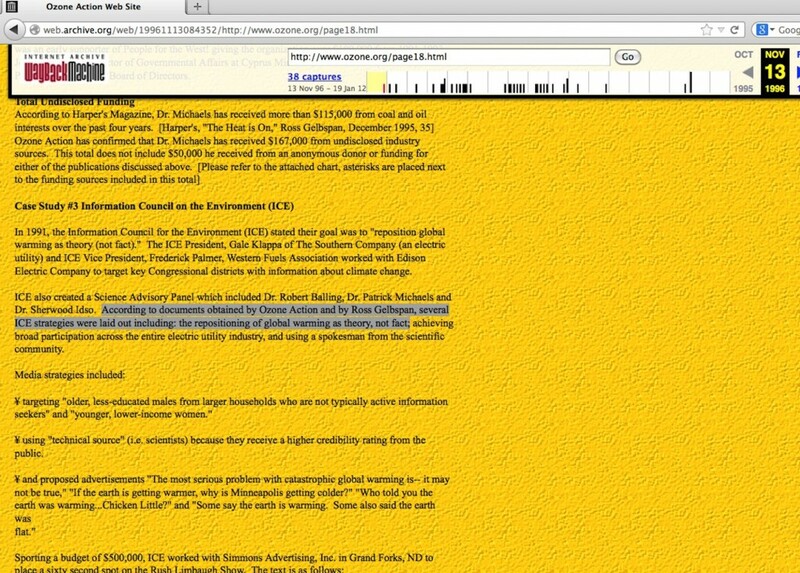 The people of Ozone Action include John Passacantando and Phil Radford, both future (at that time) Executive Directors at Greenpeace USA, and Kert Davies, future director of Greenpeace’s ExxonSecrets web site and recent go-to source for industry corruption attacks against skeptic climate scientist Dr Willie Soon, and Kalee Kreider, future long-time spokesperson for Al Gore. 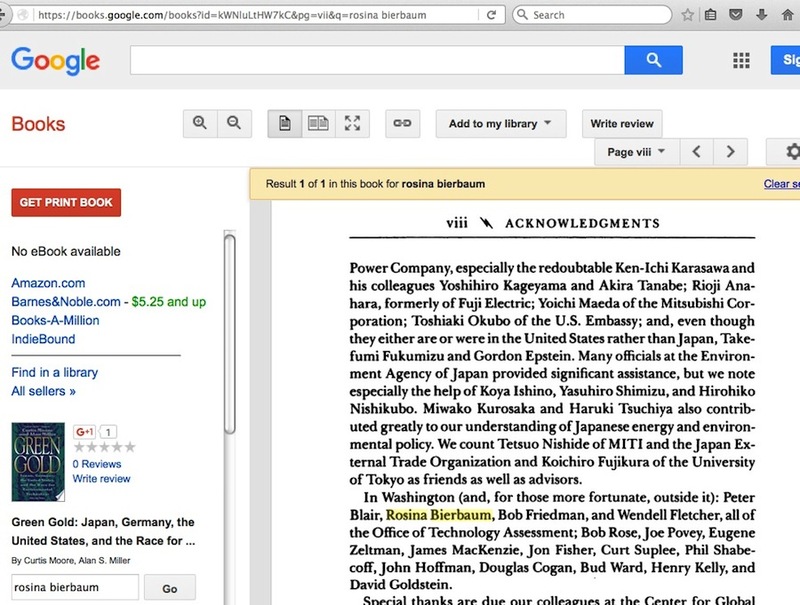 9) Naomi Oreskes, who cited Gelbspan’s 2004 book as the source of the “reposition global warming” phrase despite the plain fact that his 2004 book self-cited his 1997 book for the source of the phrase. 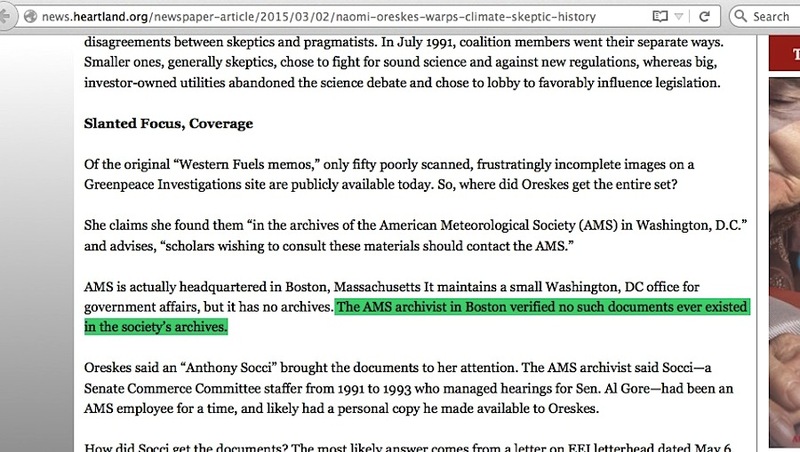 But as seen in the screencapture in item 6, she additionally says the ICE memos were archived in the American Meteorological Society archives (they actually were not), and thanked the person in item 10 below for alerting her to Western Fuels material there. 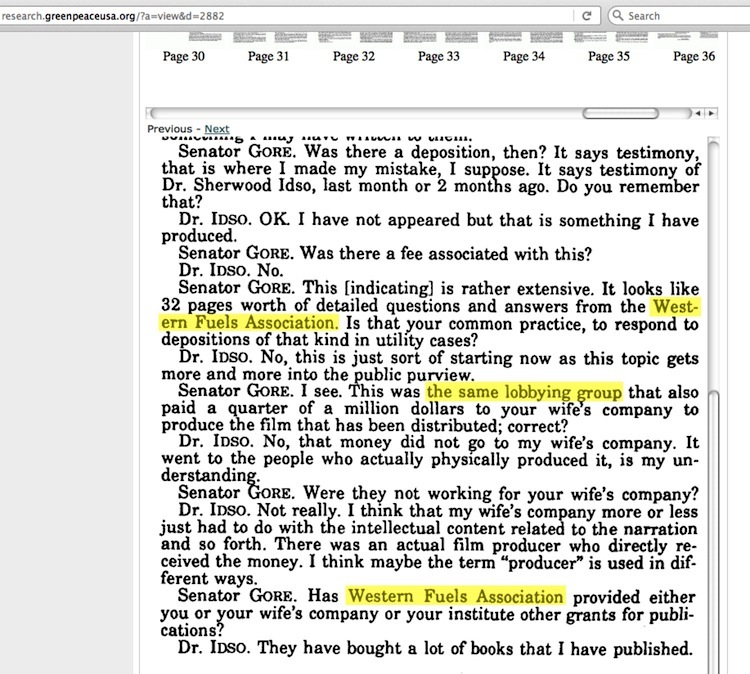 10) Anthony Socci, Senate staffer during Al Gore’s April 9, 1992 hearing where Western Fuels information was used against Dr Sherwood Idso. 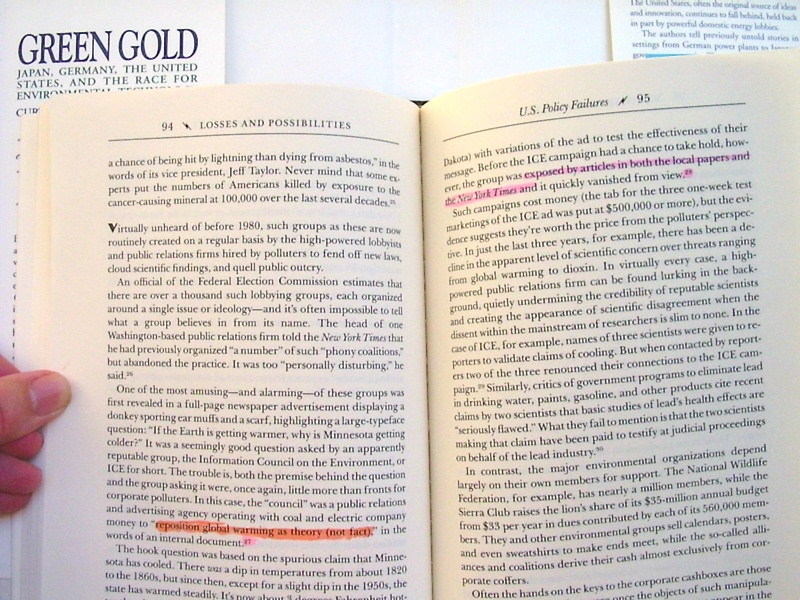 As Naomi Oreskes pointed out in her book chapter, Socci, who was later an AMS official, had notes written to the ICE campaign’s “Chicken Little” newspaper ad. 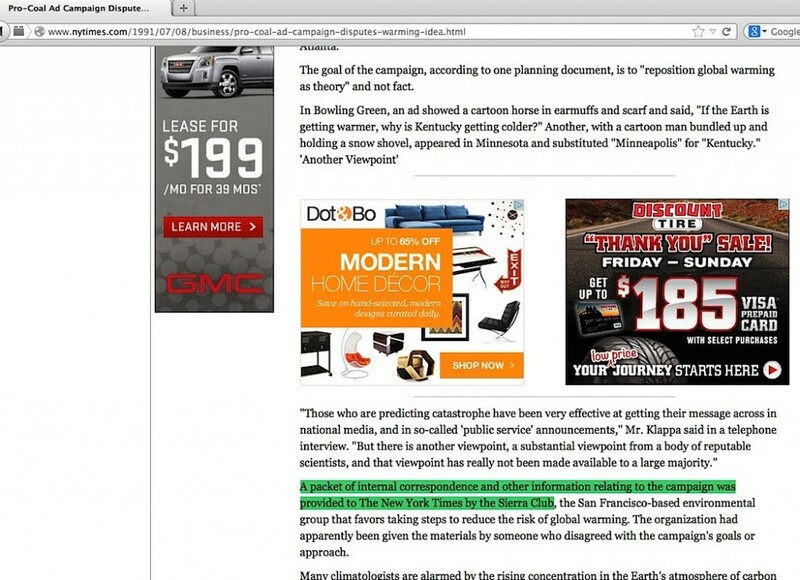 As I detailed in my December 19, 2014 blog post, that specific ad, in the form Greenpeace has in its scans, was likely never used. 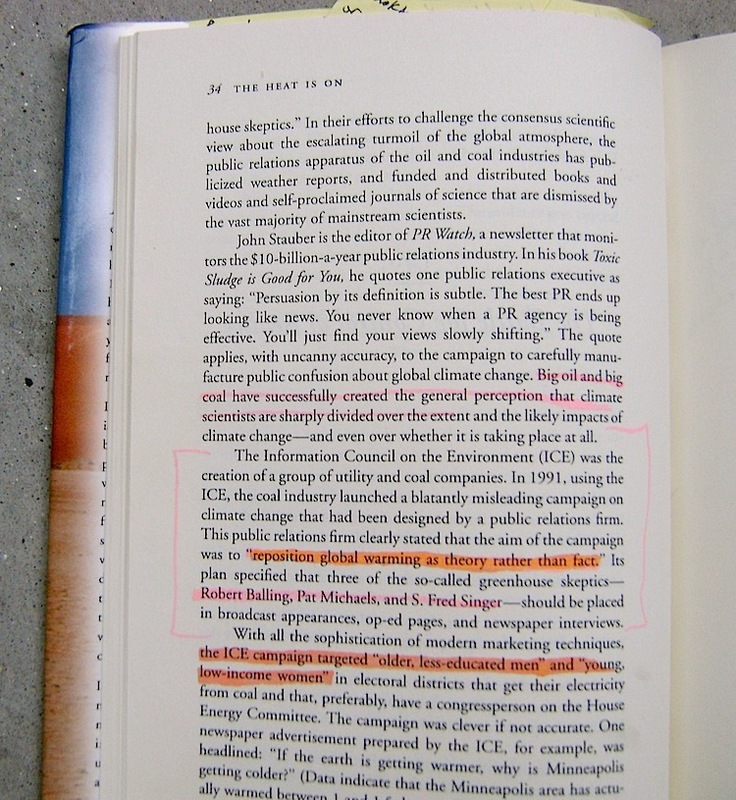 12) Al Gore, who called Gelbspan the discoverer of “one of the internal” ICE memos; Gelbspan quoted the same memo phrase in his book that Gore quoted, and Gelbspan’s book had words from the same alleged ICE memo that Gore’s 1992 “Earth in the Balance” book had….. years before Gelbspan ever mentioned anything about the ICE campaign. Notice one more thing about Gore’s bit there: he says the ICE memos were “leaked from the National Coal Association to my office.” Not from the Sierra Club or any other environmentalist group. Recall from item 6 above that Phil Shabecoff suggested the memos were “leaked by industry executives”. Once again, no tidy answers, just deep problems. 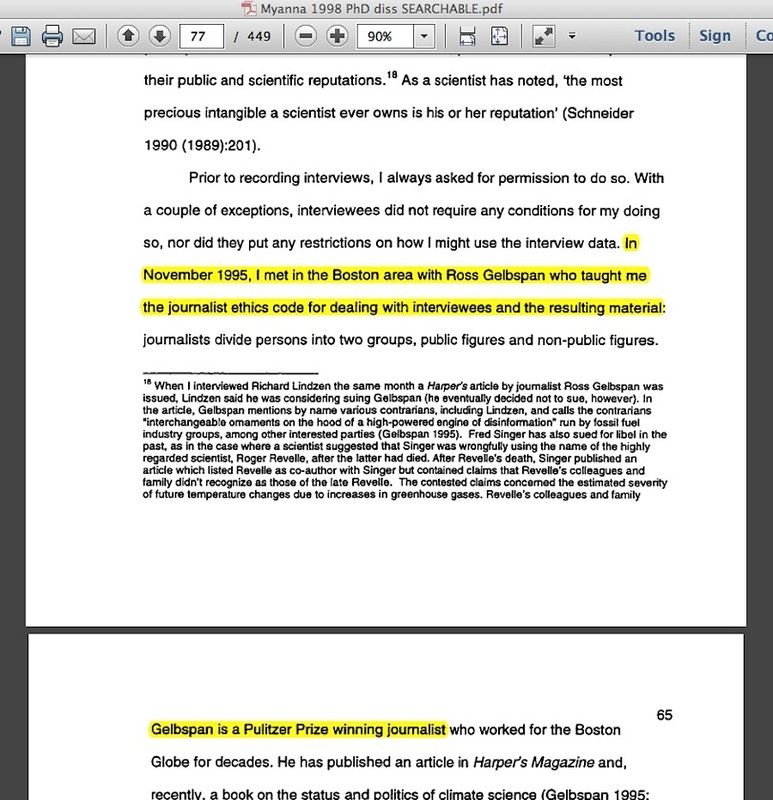 When the media traction for an entire accusation about industry-directed lies can be tracked to Ross Gelbspan’s account about a leaked set of memos, and he can’t bring himself to say where the memos came from or even show them to the public so that we can judge for ourselves whether they are proof of an industry / skeptic misinformation conspiracy, that is one deep problem. 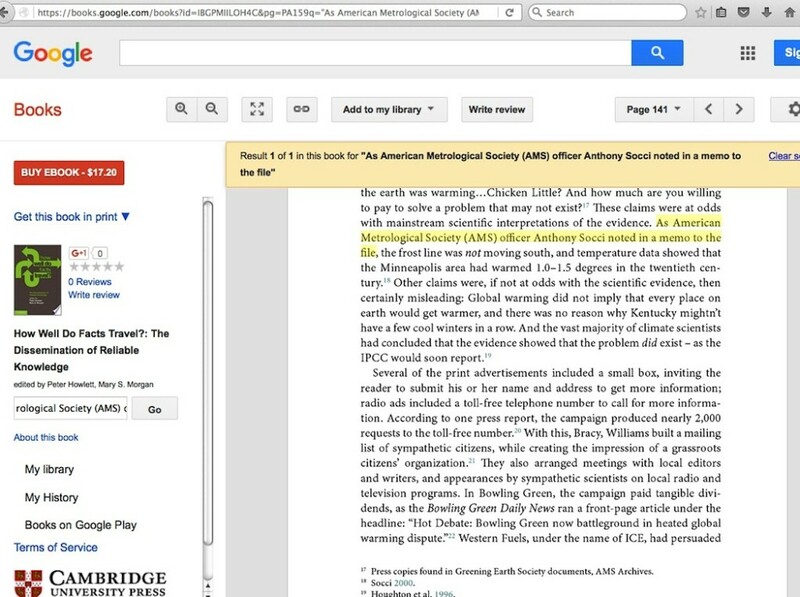 Impartial investigations could reveal whether a person having a tie to Al Gore, who apparently confirmed that Gelbspan started on his persecution of skeptic climate scientists a year before Gelbspan’s public declaration about it, is an indication of an exponentially deeper problem. 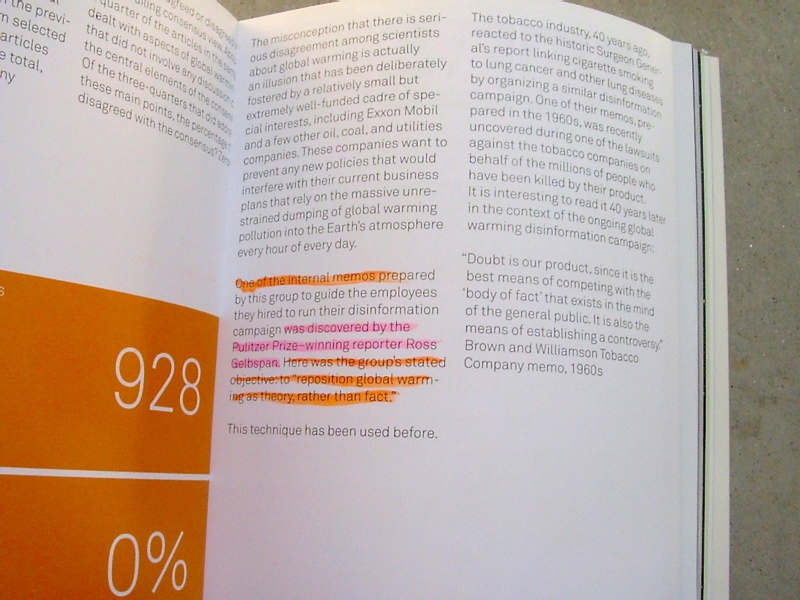 This entry was posted in accusation repetition, Tobacco Industry Parallel and tagged Anthony Socci, John Passacantando, Kalee Kreider, Kert Davies, Myanna Lahsen, Naomi Oreskes, Ozone Action, Phil Radford, Phil Shabecoff, Western Fuels Association by Russell Cook. Bookmark the permalink.